NantHealth shares dropped 14 percent on Friday after Thursday’s announcement of poor financial results, a 300-employee layoff, and re-acquisition of heavily devalued NH shares previously purchased by Allscripts. NH shares closed Friday at $3.49, valuing the company at $424 million. Above is the one-year share price chart of NH (blue, down 71 percent) vs. the Nasdaq (green, up 19 percent). CEO Patrick Soon-Shiong said in the earnings call that acquisitions had swelled NantHealth’s payroll to 1,000 employees. 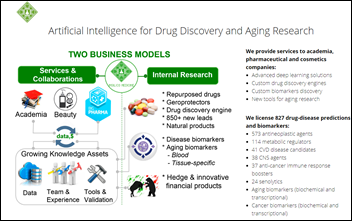 He says synergies, a refocusing on artificial intelligence and decision support products, and transferring some employees to Allscripts as part of its purchase of NantHealth’s patient-provider portal product will enable the 30 percent headcount reduction. It connects via the Internet. The user organization doesn’t pay capital expense, just a cost per concurrent user with license fees to InterSystems. The standard term is five years with renewals. Epic uses software-defined networks and state-of-the-art virtualization across compute, storage, and network. Customers can scale up or down on the fly. Epic manages the infrastructure and applies upgrades, although with more coordination than the typical cloud provider since application software requires more testing, training, and integration review. Epic provides service-level agreements for performance and uptime. Cerner, Epic, and Meditech are far ahead of the pack in terms of overall hospital count. Epic has nearly double the number of 500+ bed hospitals as Cerner. The good news for Allscripts (sort of, anyway) is that McKesson had twice as many hospitals as Allscripts pre-acquisition, but most of those are under 150 beds. 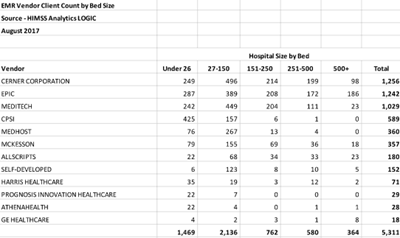 I consider 250 beds to be the minimum size hospital to provide significant revenue opportunity and that race is all Epic (38 percent), Cerner (31 percent), and Meditech (14 percent). 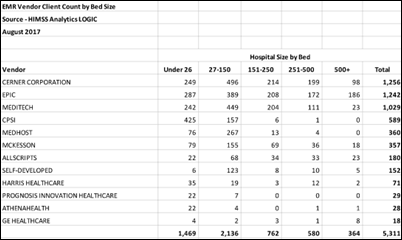 Allscripts, which was touted by a reader as being a major, competitive player that generated my original question, is not – they have just 6 percent of the 250+ bed hospital market and only 3 percent of hospitals overall vs. Cerner’s 24 percent, Epic’s 23 percent, and Meditech’s 19 percent. The unstated factors involve the “which modules” question — running a full suite of available products vs. just a few key systems from a particular vendor – as well as the overall trend in switching from one vendor to another. Hospitals are often all in with Cerner, Epic, and Meditech, but I suspect much less so with Allscripts given its more limited product line (although Allscripts has a strong ambulatory presence). There’s also the issue of which hospitals are running a system vs. who is paying for it and how much, which then gets into how health systems buy software corporately. Regardless of the slicing and dicing applied, I’ll stand by my long-held conclusion that it’s all Epic and Cerner with Meditech as the dark horse when it comes to inpatient EHRs. Everybody else is eating their dust and likely to lose business due to hospital consolidation and a shift toward the most successful vendors as much as all of us who – for our own reasons – wish that weren’t the case. We need more and better competition. It’s a slow news time every year from early August through Labor Day. After that, everybody puts their nose back to the grindstone, conferences gear back up, and a flurry of work kicks in that lasts until Thanksgiving. Until then, the news is mostly an occasional big announcement (like acquisitions and quarterly earnings reports) and a product sale every now and then. Karen DeSalvo, MD, MPH resigns as National Coordinator, replaced by Vindell Washington, MD but continuing in her full-time role as Assistant Secretary for Health. Bon Secours Health System (VA) notifies 665,000 patients that a revenue cycle optimization vendor’s mistake left their information freely discoverable on the Internet. Patient advocate Jess Jacobs dies. The FTC resolves its patient privacy complaint against Practice Fusion, which it accused of soliciting patient reviews about their doctor and posting them to its website without adequate warning. SAIC completes its acquisition of MaxIT Healthcare. The Surgeons of Lake County (IL) reports that its system was attacked by ransomware. Arkansas Heart Hospital signs a $10 million deal to implement Siemens Soarian. CMS publishes requirements for Meaningful Use Stage 2. The first screenshots of Google Health are leaked. Healthcare billing company Verus shuts down following a string of system breaches. CompuGroup wins the bidding for taking over iSoft. Epic opens its $100 million, barn-red learning center as Campus 2 construction begins and the company’s revenue hits $422 million. Walmart announces plans to open 400 in-store medical clinics. I would love to live in Maui — mild weather, beautiful landscape, and friendly people. Fiji has the most wonderful people I have ever encountered, and it’s beautiful. New Zealand is also beautiful, has wonderful people, and is progressive. I’m buying a house in both places. Near my family and my (hopefully) eventual grandchildren. A restored Vanderbilt mansion in Newport, RI in the summer and a hut on Little Palm Island near Key West in the winter. A beach house in Playa del Carmen. Notre Dame du Pre, France. New Zealand! Tropical beaches, rainforests, mountains, glaciers, and volcanoes all within driving distance (long ferry ride potentially required). Captiva Island, FL, the Caribbean island in the US. Oahu, Hawaii — slower pace of life, great weather, great people, great natural world, but still has modern world amenities. Right where I already am – on the North Shore of Lake Superior. Jekyll Island, as close to Driftwood Beach as I can get. Fairhope, AL on the bay. London on the Northern or Western ends so I can still have trees around me, and since money isn’t a factor I’m going to have a little cottage on the lower Cape, maybe Eastham or Orleans. Water, but set way back so my house won’t fall into the ocean for at least 20 years. Lauterbrunnen, Switzerland or some other spectacular Alpine town. Clean water, clean air, solar power and living life in person instead of through an electronic device. Vegas, with summer trips to the rest of the world. Coronado Island Calfornia. The best climate in the country year round and a beautiful beach! Can’t beat it. San Diego. Best of all worlds n the US. Vancouver for Canada. Hands down – Ireland (just got back – amazing), also Wyoming, Ft. Myers, FL. Florence, Italy near the Ponte Vecchio. I would live a nomadic life in a class B motor home. Then I would really more deeply experience places I’ve visited that caught my eye. Durango, CO, Travelers Rest SC, Venice FL, Seattle, WA, Saranac Lake, NY. With George Clooney. Before he was married and had kids. The house I grew up in. There I knew happiness and love. Costa Rica. It’s an amazing place with amazing people. Have been there five times and am overdue for a trip back! This week’s question, which isn’t really work related but interesting to me personally since all work and no play makes Mr. H a dull boy: which musical group or performer is the best you have ever seen in a live, in-person performance? Allscripts swaps its mostly devalued NantHealth shares for NantHealth’s provider and patient engagement solutions. NantHealth announces poor quarterly results and a restructuring that involves laying off 300 employees. UC San Diego Health migrates from its self-hosted Epic implementation to an Epic-hosted version. Nordic expands its Madison, WI office, adding space for another 60 employees. The company says the new space won’t last long as it rapidly expands beyond its 800 employees and 2016 revenue of $180 million. Technology company The Bitfury Group and Baltimore-based AI startup Insilico Medicine will work together to develop blockchain applications for healthcare. Dukes Memorial Hospital (IN) will replace McKesson with Cerner in 2018. Dupont Hospital (IN) will go live with Cerner in 2018. Carroll Hospital (MD) will replace McKesson with Cerner in 2018. UMass Memorial – HealthAlliance Hospital (MA) will implement Epic in October 2017, replacing Siemens. Bryan Medical Center – East (NE) will go live on Epic in March 2018. Santa Rosa Consulting hires Mike Ragan (NTT Data) as chief revenue officer. HIMSS Analytics expands its Logic health IT market intelligence platform with international data, increasing its coverage to 380,000 facilities in 47 countries, including 100 percent of US hospitals. In India, the head of a state-run medical college is suspended after the deaths of 60 children in the past week – at least 30 of them on Thursday and Friday alone — that local newspapers claim were due to the hospital’s oxygen vendor cutting off the hospital’s supply after it accumulated $90,000 worth of unpaid bills. The administrator says he repeatedly warned the state that the hospital didn’t have the money to pay the overdue oxygen bills but was ignored. Witnesses say doctors handed out manual resuscitator bags to family members asked them to pump it themselves as many of them watched their children die needlessly. In Ireland, Mater Hospital’s storage-area network fails, forcing the hospital – which is among the country’s busiest – to divert ambulances and cancel appointments. Here’s Vince’s final HIS-tory installment on Cerner, closing out a nice look back on the company’s history. Forrester Research names Salesforce Service Cloud a leader in its latest report on customer service solutions for enterprise organizations. Surescripts will present at ONC’s 2017 Technical Interoperability Forum August 15-16 in Washington, DC. T-System joins Athenahealth’s More Disruption Please program. Wake Forest Baptist Medical Center joins the TriNetX Global Health Research Network. ROI Healthcare Solutions hires Jeff Powell as director of business development. The CBO report is pure propaganda. Let’s consider this for a minute, the President is spending LESS of the government’s money, so how do they get a higher deficit? They’re trying to claim that it will cause insurers to raise premiums which with any degree of logic one would conclude AT WORST should equal the cut. I contend the insurance premiums would have went up anyway, but is only being used a propaganda. Please describe why an organization whose charter is explicitly non-partisan, that answers to Congress, and that is head up by a Republican-appointed director and staffed by experts would abrogate its responsibilities and instead issue “propaganda.” Or, why you are creating the false equivalency that your anonymous opinion is as valid as CBO’s expert analysis and detailed report. It’s easy these days to just shout “fake news” and “propaganda” in dismissing expert analysis without possessing the credentials to even argue the point effectively.